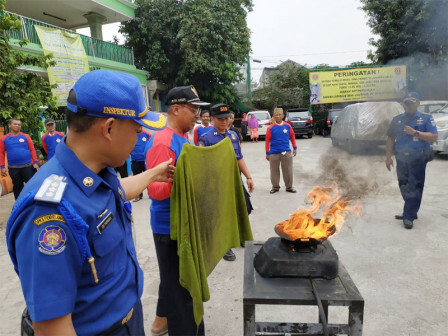 50 citizens living in RW 03, Malaka Jaya Urban Village, Duren Sawit, East Jakarta are participating in fire training, Wednesday (8/8).
" If the natural gas leaks, the main step is to close the source and then turn it off"
East Jakarta Fire and Rescue Sub-dept. Acting Head, Muchtar Zakaria stated, most residents have used natural gas facilities from the state gas company (PGN). "If the natural gas leaks, the main step is to close the source and then turn it off," he stated, when he gave training. After closing the source, leaking natural gas does not spread in the room. Basically, the handling concept is the same as handling gas stoves. The difference only lies on the installation. Citizens look very enthusiastic when participating in the socialization. Because it is the first time. Moreover, their settlements are categorized as a densely populated. "Besides theory, they are also trained how to handle fire on the gas stove using wet blanket and portable fire extinguisher (APAR)," he said.